We’d love your help. Let us know what’s wrong with this preview of Transforming Power by Robert C. Linthicum. "Justice and power must be brought together, so that whatever is just may be powerful, and whatever is powerful may be just"--Blaise Pascal. Problems plague the world around us. Many in our churches and communities face injustice, crime, poverty, racism and other daunting evils. But often Christians have not known how to respond effectively. The issues seem bigger than any "Justice and power must be brought together, so that whatever is just may be powerful, and whatever is powerful may be just"--Blaise Pascal. Problems plague the world around us. Many in our churches and communities face injustice, crime, poverty, racism and other daunting evils. But often Christians have not known how to respond effectively. The issues seem bigger than anything the church can handle, and so we are paralyzed into inaction and offer halfhearted prayers at best. Yet throughout history God has empowered his people to stand up to injustice. When the situation calls for confrontation or structural change, our response must be more than personal piety, pastoral care or individualistic evangelism. Christians must become proficient in the practice and exercise of power. Christians have often been wary of power, thinking of it as something inherently evil or oppressive. But God calls his people to wield power responsibly and to use it to promote his kingdom ideals of justice and peace. Robert Linthicum offers an integrative, biblical study of the proper use of power. Based on a thorough exploration of Scripture and decades of real-world experience in community organizing and urban ministry, Linthicum's model of relational power provides sound, practical strategies for changing individuals, communities, structures and systems. To ask other readers questions about Transforming Power, please sign up. Thick with definitions, some stories. Helpful tool for organizing churches and communities. Transforming Power is part of our internship curriculum. 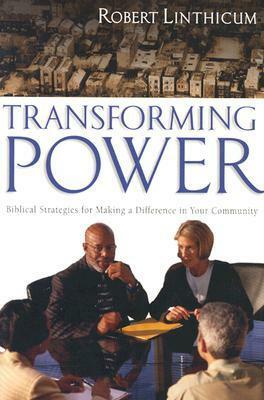 Transforming Power was a little hard to get into for the first two chapters, but contains some powerful (pardon the pun) examples of how communities can be transformed. I loved the Biblical examples of transforming power, but found it maybe inaccessible. Great to hope for though. Great Scriptural and biblical basis for faith based organizing! Great book, taught me a lot. Had a lot to say about types of one-to-one meetings and specific questions to ask for each type.